RapidCoupon is a browser add-on that is supposed to provide you with coupons, deals, and discounts from your favorite online shops. The program is promoted at rapidcoupon4u.info, which, unfortunately, is not the only source of the program. 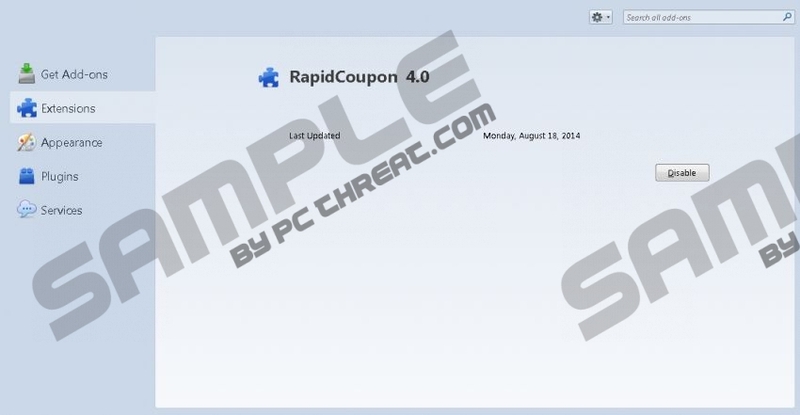 RapidCoupon is bundled with other free programs, some of which may be unreliable. For example, RapidCoupon may enter your computer when you launch the installer of a fake Java update; hence, we strongly recommend that you pay close attention to every license agreement or privacy statement before clicking the Accept, or Install, button. In case it is too late, and you want to remove RapidCoupon from the computer, move down to the last paragraph to learn how to remove the adware program. RapidCoupon has been found to be related to an adware program called BrowseToSave, which also displays coupons, special offers, web banners, and other advertisements. The two programs possess some identical files, and some of the files of RapidCoupon are also know to be related to Websearch browser hijackers. Moreover, RapidCoupon is very similar to a program called CompareToOptimize, which is based on the JustPlugIt engine. The RapidCoupon program is also capable of altering its name. The program adds some unnecessary letters to the name, so do not get surprised if you find that your Mozilla Firefox or some other Internet browser contains a strange browser add-on. We recommend that you remove RapidCoupon from the computer because this program is not liable for the content of the advertisements displayed. Moreover, RapidCoupon is not associated with the privacy policies of those websites, which means that you use the program at your own risk. This applies to basically every adware program, and, if you want to be secure on the Internet, you should avoid adware programs as much as you can. RapidCoupon automatically gathers information about Internet usage, which includes your clicks, impressions, search terms, browsing history, and some other non-personally identifiable details. If you have no intention of using the offers displayed by RapidCoupon, you should remove RapidCoupon from the computer as soon as you can. Below you will find our step-by-step instructions that will help you remove RapidCoupon from the computer, but we recommend that you use a reputable security program to get rid of this adware program. By installing a powerful anti-malware program, you will shield the system from many other Internet-based threats, so do not wait any longer but take action right now. If you want to be sure that the computer contains no dangerous files, you should install a powerful scanner. Click the button below to download our recommend scanner and invest in the program if necessary. Quick & tested solution for RapidCoupon removal.